Martian Manhunter Dark Secret Finally Exposed? As you can see, we’ve all been fooled! 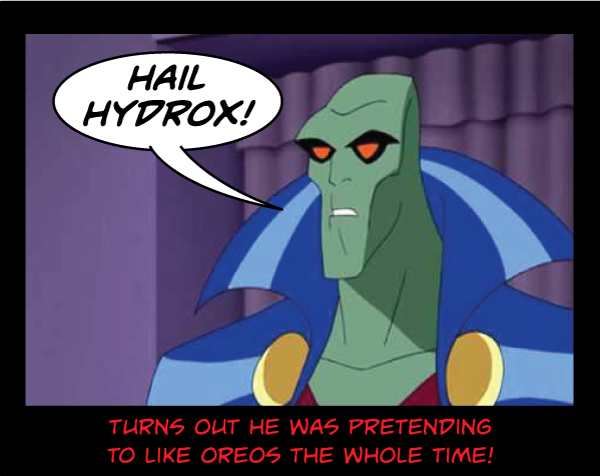 Martian Manhunter, or J’onn J’onnz as he is sometimes known, has only been feigning love for Oreos all these years. Secretly, he has been a double-agent in support of the insidiously delicious Hydrox corporation! Can you believe it? 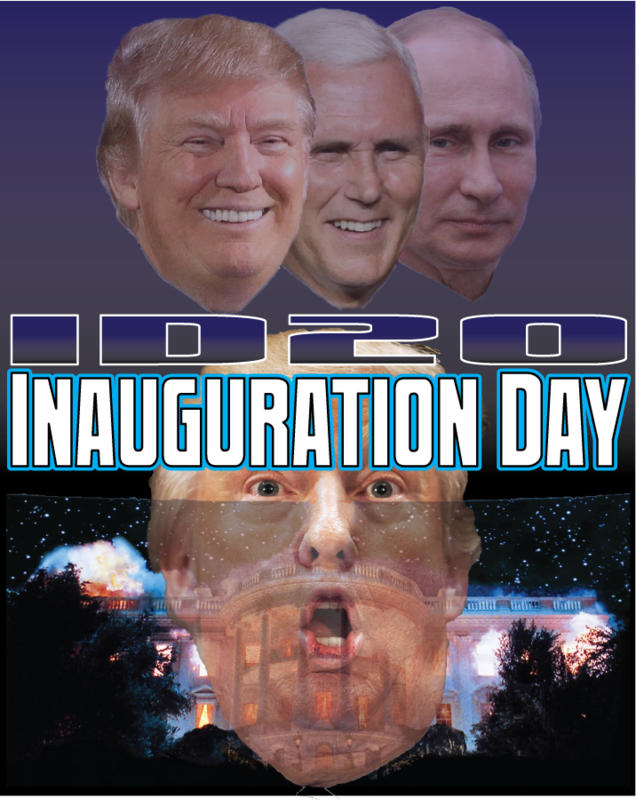 Oh, the Martianity! Did he even think of the children? Don’t forget to let me know what you think of this and remember, if you’d like an original commission by me or would like to hire me as an Illustrator, please use the Contact page and let me know as much as you can about your request. Captain America Hydra Conspiracy Explained! So… I wanted to let this simmer for a bit, so as not to spoil things for anyone but if you have been living under a rock since before last Wednesday, I can no longer help you out! Last week Marvel Comics released a new title, Captain America: Steve Rogers #1, and there was a huge reveal in it… There is a panel where Captain America utters words you never thought you would hear him say, “Hail Hydra!” and the Internet exploded. The most patriotic superhero ever created, revealed to retroactively always have been a deep cover Hydra agent? Say it ain’t so! I’ll leave it to you to actually read the comic and follow the series to see what happens… but I’m going to blow the lid off the conspiracy right now with the secret that was right under comic readers’ very noses the whole time! You see, all you had to do was blow up that panel a bit and zoom in on what Captain America is really saying to see the true story. 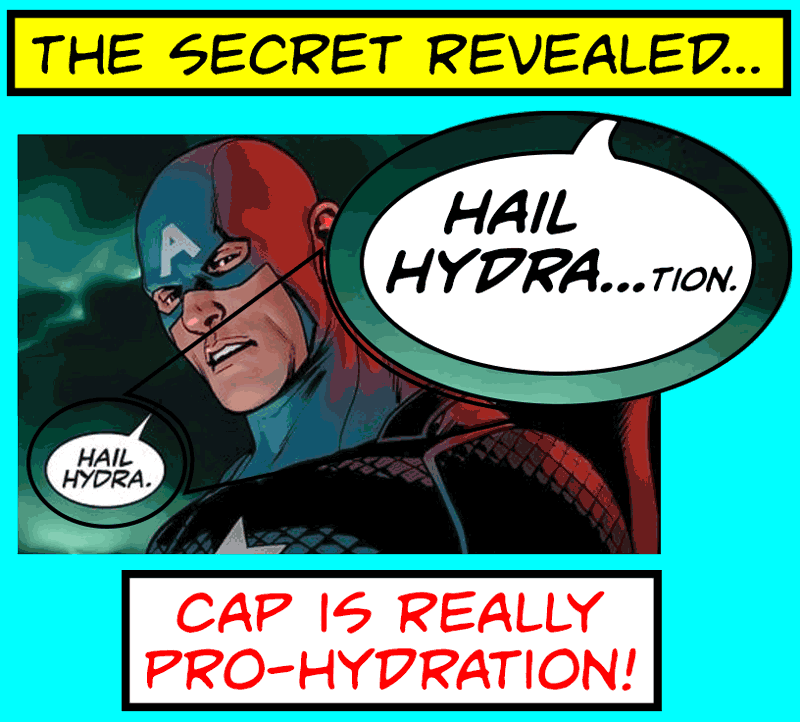 So, there you have it… Captain America hasn’t gone rogue after all… he’s just a bit parched and extremely pro hydration! Please tell all your friends so that they can sleep better tonight… and, remember, if you’d like an original commission by me or would like to hire me as an Illustrator, please use the Contact page and let me know as much as you can about your request.